Actinomycosis is a long-term (chronic) bacterial infection that commonly affects the face and neck. Actinomycosis is usually caused by bacteria called Actinomyces israelii. This is a common organism found in the nose and throat. It normally does not cause disease. Because of the bacteria's normal location in the nose and throat, actinomycosis most commonly affects the face and neck. The infection can sometimes occur in the chest (pulmonary actinomycosis), abdomen, pelvis, or other areas of the body. The infection is not contagious. This means it does not spread to other people. Symptoms occur when the bacteria enter the tissues of the face after trauma, surgery, or infection. Common triggers include dental abscess or oral surgery. The infection can also affect certain women who have had an intrauterine device (IUD) to prevent pregnancy. Once in the tissue, the bacteria cause an abscess, producing a hard, red to reddish-purple lump, often on the jaw, from which comes the condition's common name, "lumpy jaw." 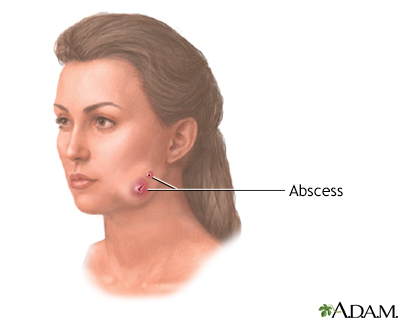 Eventually, the abscess breaks through the skin surface to produce a draining sinus tract. Treatment of actinomycosis usually requires antibiotics for several months to a year. Surgical drainage or removal of the affected area (lesion) may be needed. If the condition is related to an IUD, the device must be removed. Full recovery can be expected with treatment. In rare cases, meningitis can develop from actinomycosis. Call your provider if you develop symptoms of this infection. Starting treatment right away helps quicken the recovery. Good oral hygiene and regular dentist visits may help prevent some forms of actinomycosis. Soper DE. Infections of the female pelvis. In: Bennett JE, Dolin R, Blaser MJ, eds. Mandell, Douglas, and Bennett's Principles and Practice of Infectious Diseases, Updated Edition. 8th ed. Philadelphia, PA: Elsevier Saunders; 2015:chap 111. Actinomycosis (lumpy jaw) is caused by a bacteria introduced to face tissues by trauma, surgery or infection. Long term treatment with antibiotics is often required.